In the hands of ali.reichelt. Use TB2YACQ to reference this item. The mission is to spread bike awareness. Our grandson has started riding his bicycle We have been teaching him to do it safely. But there has been so many accidents that has involved bikes, Todie was killed while riding his, which is how Todie's Wild Ride got started. Some geocachers have been sending out geocoins to promote bike awareness in hopes we can eliminate accidents. While on the road please pay attention. It only takes a second of distraction for an accident to happen. Help make our roads safer for all by being alert, paying attention and traveling safely. I got the coin from the kinderarzt because I am a biker too . If the weather is better in Germany I will try to place the coin in the next cache. I could pass you on. And good luck with your mission. 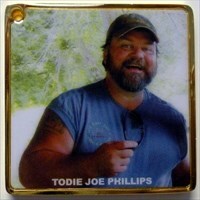 I am sorry to hear about Todie! We´re a biker-family as well... Have fun riding, buddy.